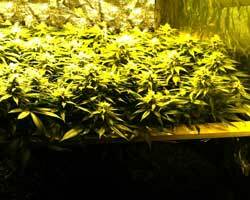 For those who might not be familiar, the term “ScrOG” (Screen of Green) refers to a marijuana growing technique that uses a net or wire mesh to control the height of the plant. If you hear or read growers refer to “SCROGing,” “scrogging” or “scroggin” a plant, this is what they are talking about. To add another confusing term into the mix, SOG (Sea of Green) is something totally different, and involves growing dozens or hundreds of very short plants. The “screen” is a wire mesh, string or nylon netting, which is put up between the plants and the lights. 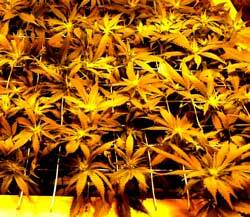 This controls the growth of marijuana plants so they tend to grow in neat rows of big colas, as pictured above. Why Only Feminized Seeds or Clones? The benefit of this method is that you make the most use of your grow lights by training your plants during the vegetative stage to make a lush screen of green. Therefore, this method doesn’t work well with with regular or unfeminized marijuana seeds, where half of all the plants will end up being males that must be removed. Because you cannot tell if a marijuana plant is a boy or girl until the flowering stage, any male plants that are removed will leaves “holes” where the males were in your lush garden, majorly reducing the overall effectiveness of this method. This is why it’s recommended to only use this method with feminized seeds or clones from a known female plant. Make sure each plant has at least 1 foot (0.3 m) between plants. You want to allow room for the plants to “bush out.” Screen of green is great for maximizing yields per the amount of plants, since it grows short, bushy marijuana plants. 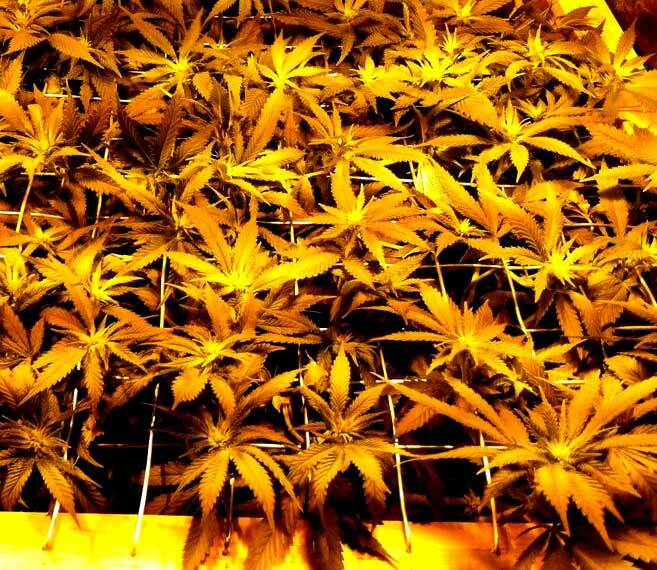 The idea is to manually train the plant to grow a nice even canopy of green, so that when you start flowering the buds grow up in even rows that make maximum use of the grow lights. Continue to keep plants below the screen using low stress training methods like bending, until about 2 weeks into the flowering stage. At this point, it’s okay to let colas start to peek through the screen. Try to train the tallest colas to grow towards the edges, outside of the light’s range, and attempt to keep the colas directly under the light as short as possible. 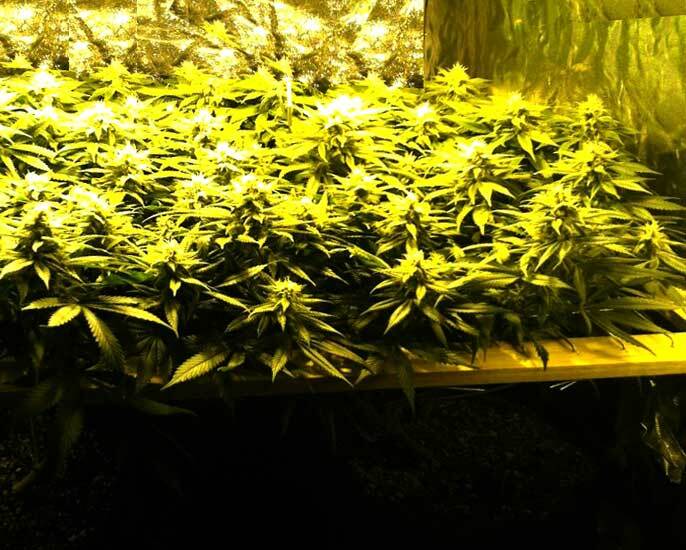 At the very least, make sure you don’t have any tall colas growing directly under the light. This helps maximize light distribution while preventing colas under the grow light from getting burned. Make sure that growing buds get access to direct light by pushing fan leaves down under the screen or removing fan leaves altogether (using proper defoliation principles). 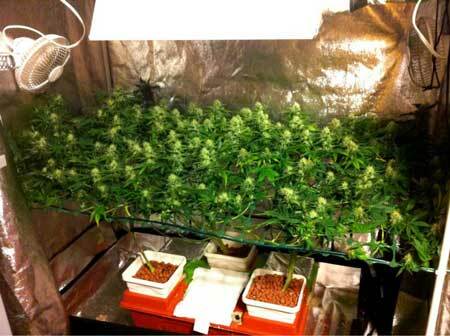 The buds will begin to grow above the screen, forming a beautifully even carpet of marijuana colas. Still want to learn more about ScrOG? Hi, the area I grow in height is an issue! So ideally the shorter the better. I read an article about scrogging your plants and It made me think, what a great way to get a nice area of even growth without growing them too tall, which is what I want. THEN I read your article about defoliation and how it can produce more buds throughout the plant even the lower areas maximising the plants potential, yet the article about scrogging tells you to lollipop the growth underneath. Trouble is I’ve already set up the mesh for scrogging the cuttings are about 10 inch tall and just poking through the mesh. Have I made the wrong choice with SCROG? Would I need to take the mesh down, or could I just continue to let it grow through and still defoliate. Answer: ScrOG and defoliation can be used together. In fact, they work perfectly to maximize the benefits of each method. Just make sure that you are also bending and twisting your marijuana plants. The net is a helpful tool, but it’s still up to you to help train the plants to grow evenly under the net during the vegetative stage. I hope today’s tutorial helps you out! And here’s a note from a reader who has been able to harvest nearly a pound of buds per plant using the ScrOG method. I grow 2 plants in a 7 foot by 9 foot grow room. There are two 4 foot by four foot scrogs, (one for each plant), set up in the center of that room and I have 1675 watts of light over each scrog. The plants are both grown in their own bubbleponics system I regularly harvest very close to or more than 1 and 3/4 pounds from two plants using this method. I am with my plants approximately 1 hour every morning right after the lights come on, and one hour every evening about 2 hours before the lights go out. I bend and twist the plant to try to fill each of the 256 openings I have in each scrog with a bud growing up and out of each of the 256 openings. So far the furthest I’ve gotten, is to fill about 200 of the 256 openings with a bud site in each opening. I’ve grown the same strain from seed, for about the last 3 or 4 grows now and with experience have figured out just when to turn lights to 12/12 for flowering so I get the right amount of stretch in the plants before harvest thus filling as many of the 256 scrog openings as possible with a bud site. I’m now trying your defoliation technique too. Since I train my plants with bend and twist I usually don’t have a shade problem that causes me to use your defoliation technique, rather, I use it to get rid of any unneeded growth so the plant is not wasting precious energy and nutrients to grow a lot of leaves that aren’t needed and instead puts it’s energy and nutrients toward growing a monster plant with many, many, many bud sites on it. I’ve been using Technaflora brand nutrients since I started and I am on my 8th crop. Each crop takes me about 5 months from start to finish. I have always used the Technaflora brand nutrients and I’ve always used them at the strength that Technaflora suggests both in veg and flower. This is likely all old news to you but just thought I would tell you my story and what nutrients I use after having read the nutrient part of your newsletter. I hope that helps you as much as it would have helped me when I started growing! If you haven’t started growing marijuana yet, today is the day!